Additive manufacturing (or 3D printing) with metal has significantly advanced the fields of aerospace, medical and industrial manufacturing with complex geometries and expedited production by eliminating the cost and long lead times for traditional molds and tooling. Inherent limitations of metal working processes – such as investment casting, machining or die casting – center on complexity. Each process is incapable of building one unit with many interlacing features and/or cannot produce without excessive labor and adjoining details, all of which are completely dependent on “line-of-sight” features. Shapes are left simple or, at best, weighted by additives, bulky overhanging walls and attachment fittings. 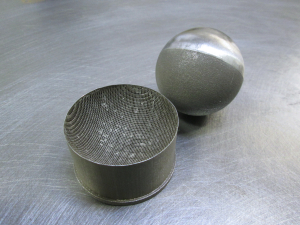 By contrast, shapes produced using the additive manufacturing process termed Direct Metal Laser Sintering (DMLS) or Selective Laser Melting (SLM) incorporate the highest level of complex features without requiring line-of-sight features or attachment post-processing. Additive manufacturing offers freedom of design, and therefore a paradigm shift away from “designing for manufacturing” into manufacturing for design. In the foreground, the DMLS part still sports the support structures necessary for a build. The background shows the DMLS part with supports removed and sanded. DMLS parts build within a chamber of inert gas to keep oxides from forming (similar to traditional processes, negating the formation of oxides keeps metals strong). The largest laser used in the DMLS process is a 400 W Yb-fiber laser. Two mirror galvanometer systems direct the laser energy using precision optics to shape the part layer by layer. The precision of this process is 40 microns on the Z-axis with an accuracy of ± 0.005” for the first inch and ± 0.002” per inch thereafter. DMLS is essentially a very fine welding process, where the welding initiated by the laser requires tremendous energy to melt the metal. In areas that are unsupported – such as overhanging features at angles greater than 45 degrees – the energy directed to the bed is so great, it causes some ablation resulting in the material being “blown out” of place rather than melting. Therefore, not only must parts be supported and welded to the bed of the build platform, but over-hanging or inner features must have built supports as well. All support material is made of the same metal as the actual part which makes the support removal process time consuming and difficult. After support removal, the part must be carefully sanded or machined for a smooth finish. However, the surface finish of a DMLS part before sanding is directly relatable to the surface finish of an investment cast part. Studies have shown that certain metals subjected to DMLS manufacturing resulted in better retention of strength and other properties than that same metal experienced from the often suggested alternative: Castingi. Parts are oriented on the build platform with the supports in mind, and areas that are more delicate are accounted for to provide easier support removal. Unlike other 3D printing processes, DMLS supports are added manually. To avoid ablation while keeping the integrity of a part, part positioning is studied to account for greater angles etc. ; positions of parts on a build platform are complementary to angle and surface requirements. Current DMLS processes offer metal compositions of stainless steel, cobalt chrome, Inconel, aluminum and titanium materials. A handful of suppliers sell variations of DMLS and SLM machinery. The main difference between these machine capabilities revolves around the process for compacting and smoothing metal powder, and the chambers the parts build within. Compacting and smoothing the powder between layers of melting is a critical factor in DMLS production. You can see the intense support structures that protected the sphere during building. Half of the sphere has since been polished while the remainder of the sphere shows signs of where the supports left off. Metal powder is eager to bond, which can result in shifting or deforming parts if the metal is not neatly smoothed between layers. Depending on the part and its needed functionality and shape, the best recoater system for compacting the powder between layers may differ. DMLS, while an incredible technology still fresh in the industrial sector, is not suitable for all metal applications. Large simple parts are better met by traditional practices of manufacturing. DMLS has the advantage in smaller, complex units and parts. The smallest features DMLS currently is capable of reproducing are ≥ 0.015”. Larger parts can be seamlessly welded, though the current build platform volume is 9” x 9” x 10”. The main significance in DMLS is cost effective manufacturing of complex geometriesii. Given the extensive support clean-up DMLS requires, it is tempting to assume it might be easier to machine and weld a part in the attempt to achieve a somewhat similarly complex unit. However, when the entirety of both processes are broken down, DMLS proves to require less manual labor and less weld post-processing than a similar part that has been machined, and achieves far more complex features with no line-of-sight. DMLS can build units completely consolidated with integral features and have a fully functioning part ready in four to five days. To prove this, Solid Concepts built a Browning 1911M pistol. The pistol was built with 34 DMLS created parts, six noncritical pieces off the shelf (such as the springs, screws and the magazine), and a handle grip manufactured with a plastic 3D printing process. 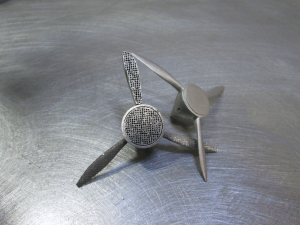 The metal components printed in 36 hours. Hand finishing took roughly 50 additional hours. Assembly time took less than seven minutes. If the gun had been built traditionally, it would have required machined patterns which can take weeks to refine. Then the gun would have required expensive casting. The barrel would have required machined rifling after being cast and post-processed. Shows the way parts are welded to the build platform. The whole process would take over a month. For Solid Concepts’ 3D printed pistol, the rifling was manufactured in the DMLS chamber simultaneously with all other features, all built in 36 hours on one machine. The pistol additionally proved the incredible metallurgical properties of a DMLS manufactured part: The barrel sees pressures of 22,000 psi and has withstood over 4,000 rounds of firing. Special details on the inner features of the subsequent guns include further complex detailing incapable with machining or casting. Projects similar in pressure and metallurgical property testing continue at Solid Concepts. The most important breakthrough of DMLS and other 3D printing capabilities is the shift in thinking away from designing for manufacturing and towards manufacturing for design. 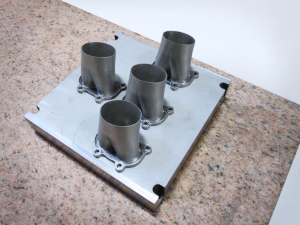 The old paradigm required design restraints conformal with traditional manufacturing process capabilities, which significantly limited the complexities of parts. With 3D printing on the industrial scale, manufacturing for design is the new paradigm. Complexities evolving towards more efficient, cost effective products on the industrial scale are beginning now with DMLS and have taken place for decades with other high performance 3D printing material. The changes in the way designers and engineers think about a new product will be indiscernible in the future, but for now it’s the biggest leap in the revolution of manufacturing since electricity. Frederick Claus is a business development manager at Solid Concepts.